So, there I was on Saturday morning: heading towards the airport to bring our boy home for Easter, thinking about not thinking about learning new things, because I was on holiday, when I spotted it and we screeched to a halt. Actually, that's not quite true. A crossroads and several sets of traffic lights meant the others circled while I jumped out to take a photo and leapt back in again at the third pass. 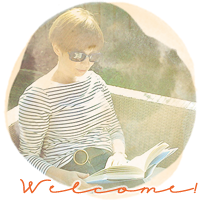 It's a good "something new", don't you think? I'm sorry now that I didn't have time to stop. Although I'm happy to say that I wasn't in desperate need of a poetical fillip then, or at any time this weekend. It's been a nice one. Our boy is back; and this year's Easter basket from Little E has pride of place in the kitchen, where I can see it every time I pass. It looks at its best at night, It lights up. With bunny lights. Honestly, he thinks of everything. Last week Mardi, Maggie, Julia, Alexa, Susanne, Helena, Fiona, Ruth, Deb, Becky, Liz, Stephanie, Cheri, Mary-Lou and Mitra were all kind enough to share their new, weekend acquired knowledge. Did you learn any thing new or try something for the first time? Let us know! We'll give you a wave! Have a good week. Now that's a clever find! I would love to meet Nurse Verse to see if she speaks poetically! She has managed to come up with something interesting to tickle the fancy. Speaking of "tickling the fancy"---E did a great job of it! How fun! And so cool that your family indulges your need to get such photos! I love it! Think of all the wonderful "Emergency ____" services that could exist!!! Now you had me worried there for a minute Sian. I saw the picture of the emergency vehicle and thought...... I don't know what.... I'm not sure your son would be too happy being collected if you were to say you were delayed by an emergency poet! Ahh mobile libraries. If you had one of those you could come and visit us. When the children were small the mobile library stopped in our yard right outside our door. I could wander out in my slippers , the girls wandered out with their books and library card. The cat, the dog all popped on for a visit. We sold the staff eggs and potatoes ( a whole stack for all their colleagues!) we offered them a comfort stop.. You get the picture? The best bit of all was if I had any overdue books I could send them back via the mobile and not pay and overdue fees! Although my father drove us to the "real" library (in another town), my childhood was really enriched by the mobile library that arrived in our little village once a week. The Emergency Poet is a fascinating concept, and I agree with Helena, a mobile crafting van would be lovely. Maybe it could provide opportunities to try new crafts! When I saw the photo popping up and the word emergency in red, my heart missed a best! Phew ... I think I need a bit of calming poetry myself now ... What a great find and how intriguing. I like the idea of an emergency craft vehicle too - a kind of pop-in and calm-down space. Little E has surely inherited his aunt's talents :). Love it! And I love the Easter basket too! 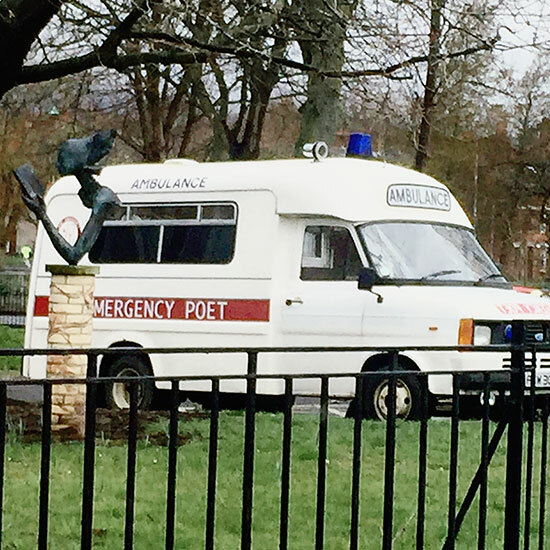 I like the emergency poet - I could use right now. This could be expanded to I need the last word right now idea ... We have the book bus that is part of the library system which visits small hamlets & villages. Lucky you with the Easter basket treats - Little E is very kind & thoughtful. I am very excited to know we have an emergency poet in this world. It's comforting. I wonder if you could call in or if it needs to be in person. Glad you had a nice Easter, we did too. There has been a lot of work involved with ours, but it's always nice to get stuff done around the house! Hugs! P.S. did the bunny deliver yarn in your basket for socks? I'm curious. Mine brought scrapbooking flowers...very low cal, but so satisfying! I think everywhere should have an emergency poet! That basket it very cute, he certainly does think of everything! What a fantastic discovery and concept! So happy your had a wonderful Easter. what a great idea, I can see why it had to be snapped! That certainly wins the prize for originality! An Emergency Poet eh? Who knew such a thing existed? What a brilliant post. 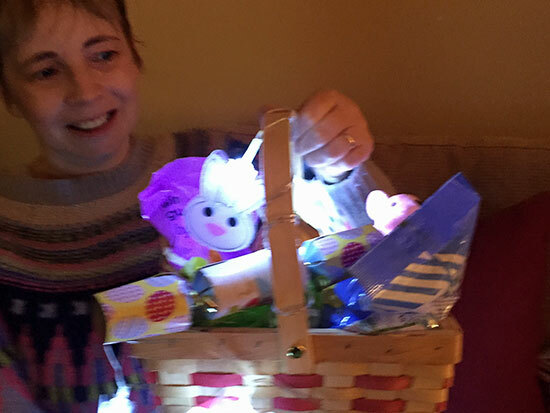 And Little E wins the 'Best light up Easter basket' award too! An emergency poet is something the world needs more of. We had a bookmobile when I was a kid. It came to the end of our lane every two weeks & was mostly stocked with children's books & what would now be called YA. I haven't seen one in decades though. 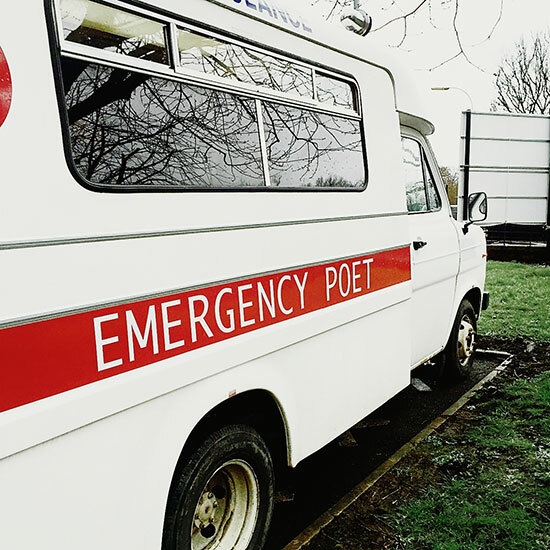 Emergency poet....what a wonderful idea. What a fabulous find! I love when you find something you weren't expecting. Your Easter basket is very cheery too! Well, now I've learned about something new, too. Who would have ever thought of an Emergency Poet!! Getting back into a routine this month, so hopefully I'll be joining in with something new of my own on Mondays this month. Happy April! Who'd have thought eh. I'm wondering if we'll see more in the future. Now's there's a profession to be envied - emergency poet. It ranks right up there with Easter basket assembler. What an absolutely novel idea! LIke your idea of an Emergency Librarian too! Little E's basket looks so cute.